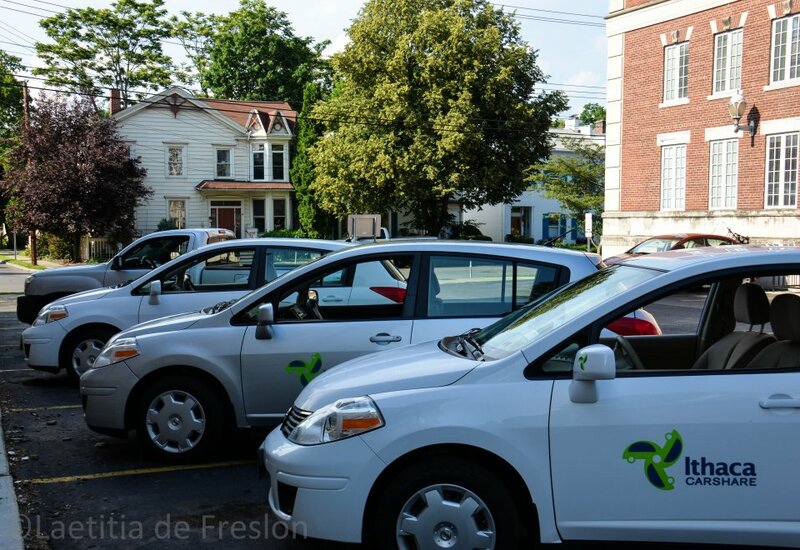 The Ithaca Carshare fleet is made up of Toyota Prius hybrids, Honda Fits, two Toyota Yaris, a Toyota Tacoma pickup, and a Dodge Grand Caravan. Our cars are reliable, clean, well-maintained, fuel-efficient, spacious, and ready to go. You’ll love them! Our 2017 Toyota Tacoma pickup truck is located at the intersection of North Cayuga and Farm, just north of the creek. This spot is ideal for those who may need to drive to the location since there is free on-street parking around the area. Remember, do not park any other vehicles in an Ithaca Carshare space, or it may be ticketed or towed without notice! There a Recycling and Solid Waste Center (RSWC) sticker on the window. Information about the using the RSWC is inside the glove box and also accessible at the Tompkins County Solid Waste website. We have covered the cost of the permit, but you are responsible for any other fees associated with disposing of trash. Remember, it’s free to drop off your recycling, compost, and plastic film! The bed of the truck has a plastic liner, which is durable and easy to clean. 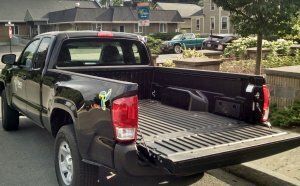 If you haul compost, mulch, manure, gravel, garden gnomes etc., please wash or sweep out the bed of the truck before returning it. The next member may be moving furniture, and won’t want a messy truck bed. – The gross loaded capacity is 1,500 pounds, including passenger weight. Do not overload! Pickup truck bed dimensions are 6 feet by 4 feet (3.5′ between wheel wells, 1.5′ tall). Rope, bungees, and tarp are stored behind the seat in the flat compartment. This van has seats for 7. It is equipped with Stow’n’Go seating (all rear seats fold flat into the floor). Please return seats to their upright position when you finish. Stow’n’Go directions can be found in the glove compartment. Interior dimensions with seats stowed are 7.5 feet long, 4.5 feet tall, and 5.3 feet wide. It also has a permit for the Tompkins County Solid Waste Center. Please avoid using the van for messy loads like hauling wood, mulch, or leaky trash. See www.recycletompkins.org/ for details. Check out our vehicle map to find where you can pick up these vehicles.